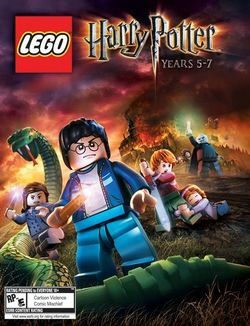 LEGO Harry Potter: Years 5-7 is a LEGO video game in the Harry Potter Theme. It is the the sequel to LEGO Harry Potter: Years 1-4, and while its predecessor covered the storyline from the first four installments of the franchise, the sequel covers the last four installments (the seventh part, just like the film version, is split into two parts). It was released November 11, 2011 in the United States and November 18, 2011, in the United Kingdom. It has been released on the gaming platforms of Xbox 360, PS3, PC, PSP, DS, Wii, PS Vita, 3DS, iOS, and Mac. The Mac OS X version of the game was released by Feral Interactive on 7 March 2012. THE BATTLE IS BUILDING! The sequel to the hit video game is now available for the iPhone, iTouch and iPad! STUNNING GRAPHICS New iOS graphics engine taking LEGO games to the next level. INTUITIVE TOUCH SCREEN CONTROLS Touch the screen to cast spells and target objects, use the interactive display to change characters and spells simply by touching their icons, and recreate iconic duels by casting and deflecting spells with your fingers tips. LEADER BOARDS Complete the game to 100% in the fastest time and post your scores to the leader board. Compare your score against friends or the whole world! DUELING CLUB EXPANSION Add the Dueling Club expansion and master advanced dueling skills against a host of famous witches and wizards including Professor Snape, Kingsley Shacklebolt, Lord Voldemort and many more. Defeat each category leader to unlock them for use in Free Play mode. The Menu is Hogwarts Castle while it's raining with Death Eaters trying to get through the protection shield; and the track from Harry Potter and the Deathly Hallows Part 1 "Snape to the Malfoy Manor" is playing. There are more than 200 Characters to unlock. Harry Potter, Hermione Granger, Ron Weasley, Neville Longbottom, Molly Weasley, Ernie Prang, Rubeus Hagrid, Lucius Malfoy, Professor Dumbledore, Professor McGonagall, Remus Lupin, and Professor Sprout have their appearances in recent sets. Sirius Black, Dudley Dursley, Rita Skeeter, and Dementors' will have a redesigned appearance. Cornelius Fudge, Death Eaters' and Mad-Eye Moody will have the same appearance as they do in LEGO Harry Potter: Years 1-4. Hogwarts students do not wear capes like they did in LEGO Harry Potter: Years 1-4. Professor McGonagall has a black hat in this game. In the Screenshots Lucius Malfoy had his old variation, but in the game he has his new variation. Several of the characters aren't even in the 5th - 7th years, and were in the 1st - 4th years. Hogwarts Castle looks like it does in Harry Potter and the Deathly Hallows. Now, you can leave Hogwarts, go to Hogsmeade and to its Station, take the Hogwarts Express and arrive at Kings Cross, go around London, to the Leaky Cauldron and also to Diagon Alley. Weasleys' Wizard Wheezes is accessible after Year 5. Diagon Alley is the Main Hub, and the other hub is Hogwarts. There are 5 usable potions in the game. The Elder Wand's appearance is updated, being more detailed rather than just a brown stick. Gold obstacles are new in the game and only characters with the Elder Wand can destroy them. Unlockable Characters: Tom Riddle (Orphange), Professor Dumbledore, Hagrid (Wedding). A version of the 3DS release also contained 30111 The Lab inside the case as a free gift. This is a description taken from LEGO.com. Please do not modify it. (visit this item's product page) LEGO® Harry Potter™: Years 5-7 continues the saga of the Boy Who Lived in this spell-binding adventure for wizards and Muggles alike. This time, players are transported through the final three books and final four films - Harry Potter and the Order of the Phoenix™, Harry Potter and the Half-Blood Prince™, and Harry Potter and the Deathly Hallows™ – to experience Harry’s last years at Hogwarts™ and battle Lord Voldemort™ in the ultimate fight of good vs. evil. The creative LEGO prowess unites with the expansive world of Harry Potter™ once again to deliver an exciting and rewarding gameplay experience. The game features lessons, spell-casting, dueling and much more for players of all ages to enjoy. LEGO® Harry Potter™: Years 5-7 takes players through Harry’s heroic endeavors as they travel through various worlds encountering new faces, new lessons, new challenges and new spells. Master advanced duelling skills and battle toward the ultimate showdown with the Dark Lord himself. Discover and unlock characters including, Fenrir Greyback™, Bellatrix Lestrange™ and Professor Horace Slughorn™. LEGO Harry Potter Years: 5-7 Poster. Harry and Ron roam Hogwarts at night. Harry, Ron and Hermione roam Hogwarts at night. Harry and Hermione at Hogsmede Station. Ron during the Final Battle. Bellatrix Lestrange casting a spell. Lupin and Tonks in love. The Atrium in the Ministry of Magic. Umbridge in her Hogwarts office upon capturing the D.A. Fred and George, Ron, Harry, Hermione, Ginny, and Neville. Lucius and some Death Eaters hold Ron and Ginny hostage. Sirius confronts Lucius in the Department of Mysteries. Harry Potter and Dudley Dursley in the park. Harry and Ginny in the Room of Requirement. Harry and Dumbledore searching for Horace Slughorn in the beginning of Half-Blood Prince. The trio in "Harry Potter and the Deathly Hallows Part 1"
Facts about "LEGO Harry Potter: Years 5-7"
This page was last edited on 19 March 2016, at 15:23.